Like all top-notch showmen, John Bill Ricketts knew what audiences wanted, and figured out how to give it to them, and he figured that what amused the English would amuse Americans still settling into the rigors of building a new nation just as well. So when he arrived in Philadelphia in 1792, it was just a matter of time before America's first circus came to town, too. 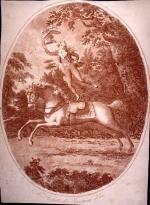 Etching of Mr. Bill Ricketts, "the Equestrian Hero," circa 1796. The idea of the formal circus was relatively new then, though itinerant jugglers, acrobats, and clowns had wandered Europe, entertaining commoners and kings alike, for centuries. But no one had put their various acts together on one bill until 1770, when Philip Astley, a British cavalry officer and war hero, began performing feats of derring-do on horseback around a riding ring in London. When he added tumblers, wire-walkers, performing dogs, and a clown to fill time between his own demonstrations, the circus - from the Latin for ring - was born. Like Astley, Ricketts was a magician on horseback. He could hang from a stirrup, vault from the saddle to the ground and back to the saddle at full gallop, ride two horses - standing - simultaneously, and juggle oranges astride his mount while circling the ring backwards. In the mid-1780s, he joined a circus founded by one of Astley's rivals. He soon smelled opportunity with every bit of sawdust he inhaled. His nose led to Philadelphia. Settling into the new nation's capital, Ricketts immediately capitalized on Americans' love of the horses they so relied on for transportation, recreation, and work. He built a marvelous structure - a white amphitheater with a conical roof and majestic entry columns - to house a riding ring. He opened it for business as a riding academy, teaching the equestrian arts to proper Philadelphians, and training horses for himself. By spring he had schooled enough horses to mount the kind of equestrian entertainment he had headlined in London, and on April 3, 1793, he introduced the circus to America and America to the circus. For the first month, Ricketts performed alone in the ring to the delight of the city's amusement-hungry crowds, which included, on April 24, the nation's most distinguished horseman, President George Washington. 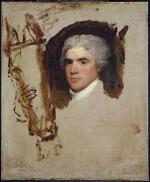 John Bill Ricketts, by Gilbert Stuart, circa 1795-1799. By May, Ricketts had added a few more demanding tricks to his repertoire, filling the time between his tricks with two other performers: a tightrope walker and a juggling acrobat. A month later, he added a small band and an equestrian pantomime - essentially a play performed on horseback - to the program; and by July, his fame spreading, Ricketts took the show on the road for a fourteen-month tour that reached from Baltimore to Boston. Audiences delighted in the show's novelty, variety, and exotic skills, and Ricketts, ever the showman in search of the broadest possible audience, emphasized its wholesomeness with advertisements beckoning parents to bring their children. Come one, come all. Over time, the circus's popularity soared as he padded the proceedings with more acrobats and clowns as well as singers, dancers, and more elaborate pantomimes to complement the equine exploits that remained the circus's centerpiece. In 1795, success led him to build a second amphitheater - in New York - and, in 1797, he became the first to bring a circus into Canada. Wherever he went, Ricketts was a sensation, and Philadelphians, particularly, reveled in their local showman and the show that, in the words of a contemporary observer, was "esteemed amongst the first amusements met with in this truly astonishing Metropolis, as a place to dispel the gloom of the thoughtful [and] exercise the lively activity of the young and the gay." But it was more than that, really. Long before circuses took on the odor of a crude and common entertainment, Ricketts had an air of snob appeal; embraced by all classes, his circus became an especially prestigious venue for the right people to be seen at. After all, Washington, an unabashed fan, attended from time to time through his tenure in office. And the President and Ricketts regularly accompanied each other on rides through the city out into the countryside. Ricketts became such a prominent celebrity that Gilbert Stuart, Washington's portraitist, painted Ricketts, too. Washington even allowed Rickets to put Jack - the famed white steed he rode through the American Revolution - on display in the amphitheater. Hence, a certain patriotic panache and status boost came with every seat. And seats were hard to come by. Masters dispatched servants to hold coveted boxes, and it was not uncommon for those without tickets to bore holes in the amphitheater's walls and roof to sneak a peek. For awhile, there was even a brisk business in counterfeit tickets. In 1797, Ricketts marked Washington's retirement with a special performance, and later that year, he performed for his friend's presidential successor, John Adams. 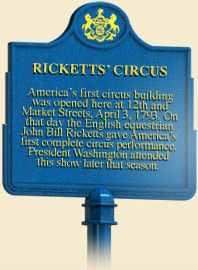 Ironically, just three days after Washington's death in 1799, Ricketts' circus died, too. Distraught when a fire destroyed the Philadelphia amphitheater, Ricketts had set sail for England. The ship - and the man who brought the circus to America - were both lost at sea. John Durant and Alice Durant, Pictorial History of the American Circus (New York: A.S. Barnes and Co.), 1957. James S. Moy, "Entertainments at John B. Rickett’s Circus, 1793-1800," Educational Theater Journal 30:2 (May 1978): 186-202.